LONDON, Aug 1, 2012/ — Alexandra Jefford, Fernando Jorge, Hannah Martin, Hillier, Husam El Odeh, Imogen Belfield, Jo Hayes Ward, Jordan Askill, Melanie Georgacopoulos, Sophie Bille Brahe and Tomasz Donocik and Yunus and Eliza, now to be known as the Rock Vault Dozen have joined the exclusive list of British designers who had been hallmarked for their work. As announced today by the British Fashion Council (BFC) and the International Palladium Board (IPB), the Rock Vault Dozen is mandated to design a ring created from up to an ounce of the precious metal, Palladium. These rings will be showcased in a dedicated exhibit as part of the BFC’s Rock Vault, sponsored by the International Palladium Board and curated by Stephen Webster, during London Fashion Week (LFW), September 2012. The BFC Rock Vault is a unique showcasing initiative developed by the BFC to nurture the creative, fine jewellery talent based in London and to give designers the opportunity to further develop their businesses and increase exposure amongst UK and International media and retailers. It was launched at LFW in February 2012. 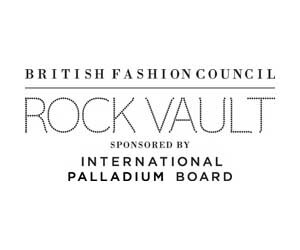 For more information please visit www.britishfashioncouncil.com/rockvault.